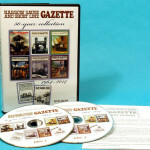 The Narrow Gauge and Short Line Gazette recently released their entire series of publications from 1975 to 2014 in a DVD set. This set also includes the complete run of Finelines (1964 – 1975) and Slim Gauge News (1970 – 1974). This adds up to: 239 GAZETTE issues, 57 FINELINES issues, 18 SLIM GAUGE NEWS issues, a total of 25,220 pages; with 1,828 plans and scale drawings. The discs are professionally packaged (we would expect nothing less from the Gazette! ), installation instructions and other helpful information included on the pamphlet inside. These discs work on Windows and Mac operating systems and require installation. The viewing application is created in Adobe Air and quickly installed. The user interface of the viewer is tastefully designed and includes several handy sorting features. You can switch between thumbnail and list view, sort by date and filter by publication. Viewing an issue is as easy as double clicking the cover from the application. You are presented with high resolution scans of every page (front and back covers included). These issues are complete, right down to the advertisements vintage advertisements. 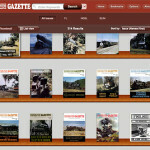 Early issues (from 1964 – 2003) are presented as page scans with searchable text. Later issues are conversions of the source files used in publishing and contain embedded fonts which are visually much sharper than the scans. At the bottom of the user interface is a collapsible menu that displays a thumbnail of each page. Additional tools like bookmarking, indexes and the ability to search by title, author and keywords make finding information easy. The application includes a couple options of note including the ability to disable the page flip animation and to fully install the files to your system (removing the need to take the DVDs off the shelf). I have made full use of this local storage option and now keep the entire set on my laptop for reference when I travel (this requires about 14GB of space). Printing articles and drawings is possible from the scans. The instruction/insert that comes with the provides tips on scaling the print output to match your preferred scale. You can even open issues directly with Acrobat Reader and they should be usable on your handheld devices (I have not tested this yet). My only complaint about the interface is the apparent lack of a true full screen mode. This can be easily remedied by opening each issue through Acrobat (or your preferred PDF viewer) directly. 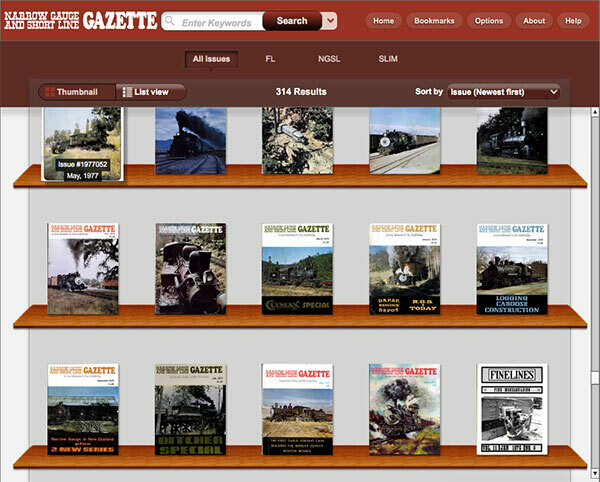 As an avid collector of Gazette issues I am quite pleased with the quality of these digital editions. Having them on DVD has reduced the physical storage required to keep these as a reference. Except for a few issues, I’ve lightened my collection since this arrived. The ability to quickly browse and search through the entire run has made it an invaluable tool. I highly recommend this collection to the hobbyist and/or researcher as an essential research tool. 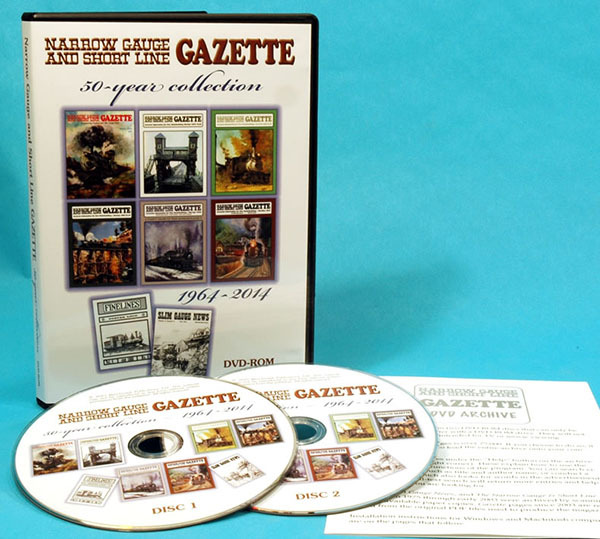 Comments Off on Product Review: Narrow Gauge and Short Line Gazette DVD Archive.